NovaBACKUP Bus. Essentials automatically backups and protects important Windows Server files and system information with SQL/Exchange support. With easy setup and simple to follow step-by-step wizards, anyone can implement professional data backup procedures in minutes. Support for Windows SQL 2008 & Exchange 2007. Receive full peace of mind with auto processes. local and online storage (Best Practices), and full disaster recovery protection. Pentium III or better, 512 MB of RAM minimum, 1.5 GB free hard drive space minimum, IE 7 or higher. ...... plus get online data protection from your choice of world class storage providers ... all in the same, easy to use, software. Receive full peace of mind with automatic (set it and forget it) processes. local and online storage (Best Practices), and full disaster recovery protection to return your system exactly as it was in the event of disaster. Including over 4500 high quality and professionally written business letters. Qweas is providing links to NovaBACKUP Business Essentials 12.2 as a courtesy, and makes no representations regarding NovaBACKUP Business Essentials or any other applications or any information related thereto. Any questions, complaints or claims regarding this application NovaBACKUP Business Essentials 12.2 must be directed to the appropriate software vendor. 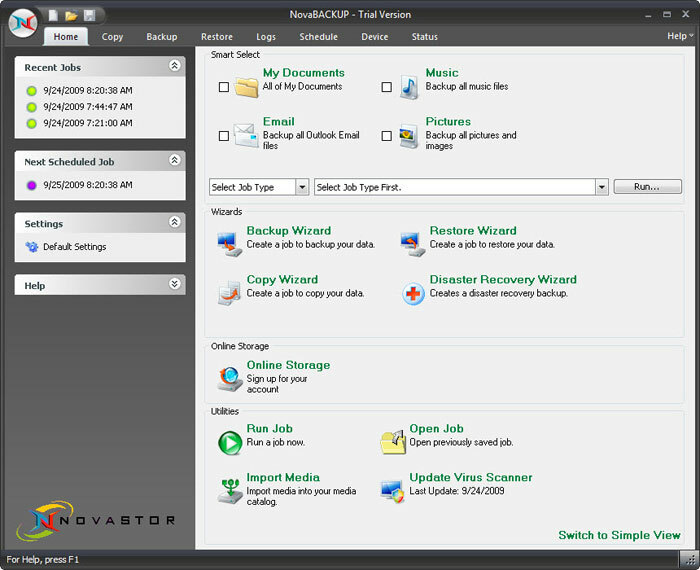 You may click the publisher link of NovaBACKUP Business Essentials on the top of this page to get more details about the vendor.